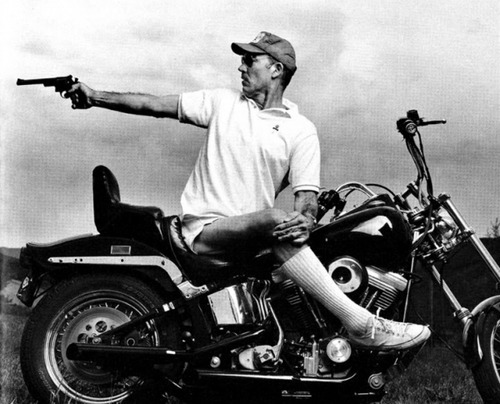 I finished Hunter S. Thompson’s Hell’s Angels yesterday. The epic piece of journalism in which he is ’embedded’ in the motorcycle gang for a few months holds up well, although I’m astounded to see how much casual racism is in his writing. So it must have been a giddy revelation for the Bass Lake Chamber of Commerce to discover that the Hell’s Angels’ presence — far from being a plague — was in fact a great boon to the tourist trade. It is eerie to consider the meaning of it. If the Hells Angels draw standing room only any half-hip chamber-of-commerce entertainment chairman should see the logical follow-up; next year, bring in two fighting gangs from Watts and pit them against each other on one of the main beaches . . . with fireworks overhead while the local high school band plays Bolero and “They Call the Wind Maria” (147). I thought I owned a copy of this book, but couldn’t find it, so I stopped by the library to get a copy. The librarian reminded me that Hunter S. Thompson books tend to get boosted from the library. Now that is a legacy. The other quote that struck me was about the Marlon Brando movie The Wild One which was an fictionalized antecedent to the moral panic of motorcycle gangs running amok. Thompson makes the case that the film itself helped to create rebel identity — solidifying a previously misty image of themselves. The truth is that The Wild One — despite an admitted fictional treatment–was an inspired piece of film journalism. Instead of institutionalizing common knowledge, in the style of Time, it told a story that was only beginning to happen and which was inevitably influenced by the film. It gave the outlaws a lasting romance-glazed image of themselves, a coherent reflection that only a few had been able to find in a mirror, and it quickly became the bike rider’s answer to the The Sun Also Rises (66). In the field of communication this process of identity formation might be called ‘constitutive rhetoric.’ To create an audience by virtue of their description in media. From Mountain Dew consumers, to the folks who tattoo themselves with the Nike logo, this is a valued space for inquiry. It is worth noting that the previous person who took out his book was inspired to capture a small pixie or bat in between two of the pages. The way people will store old leaves in a book, this lunatic stored old dead critters. I discovered this when a few pages before the creature a sinister stain began to emerge in the middle of each page. Engaged I simply turned the pages, avoiding the funky stain. And then in the middle of chapter two, two pages stuck together cradling a dead being.